In Windows 8 as previous versions of Windows you will see notifications time to time. These notification are snippets and come out from the server. Some of them are useful for user and operating. But some are trifles and only disturbs users. So you can manage these messages or notifications by following a few steps. There are two styles of windows 8 notifications. Here I am trying to analyze these notifications and at last presenting some processes to get rid of. 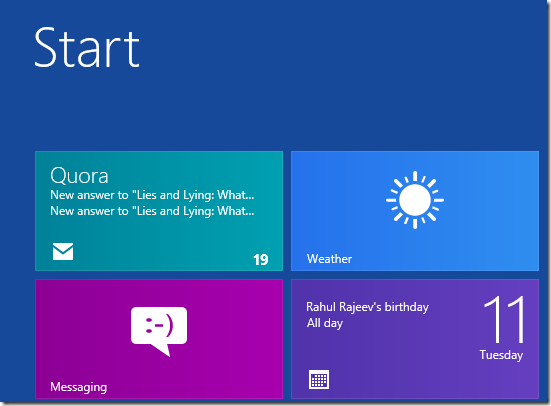 Live Tiles notification is found in windows 8 modern apps in metro screen window. It shows the updates about new incoming emails, images and current information in metro screen tiles. Toast notification is available in both metro screen and desktop. It emits pop up on the upper right area of your screen. The messages come out on screen time to time and are associated with apps or events regarding with users. Toast notifications are extremely useful time to time, but it also creates trouble when video game or movie is running. 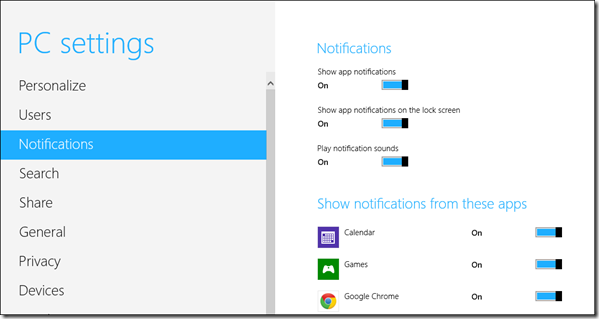 How to disable Notifications in windows 8 ? There are following methods to disable notifications instantly. 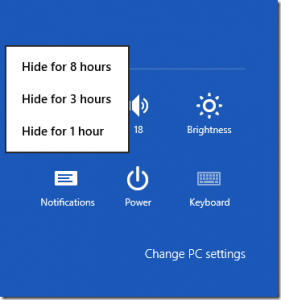 It helps you to disable windows 8 notifications for maximum 8 hours in silent mode. Press shortcut Windows key+ I to start charms settings window. Choose Notification icon at the bottom and select the time stage (1 hour, 3 hours, 8 hours) from right panel to disable it. Choose Settings options from metro charms bar. Now choose Change PC settings button at the bottom. Now you get PC settings window. Click on the Notifications button in left panel. Here you will have to choose following options to change settings under windows 8 toast notifications.